Earnest Ice Cream, Spread ‘Em Kitchen, and Nuba have something in common. They all received help scaling their businesses through workshops offered by Feeding Growth. Launched in 2015, Feeding Growth has helped more than 300 food entrepreneurs grow their sustainable food businesses. It’s where entrepreneurs turn to gain expertise in branding, marketing, sales, distribution, manufacturing, growth and sustainability. Feeding Growth is an LFS initiative led by the Centre for Sustainable Food Systems at UBC Farm, and partners include Vancity and Fluid Creative. B.C. food industry veterans give back to the rookies, presenting their insights in the five-workshop series Scale Your Progressive Food Business as well as its Coffee Series dialogues. Feeding Growth experts impart the wisdom of someone who has been there, made mistakes, and found a path to success. Feeding Growth alumni and the experts that support them have formed a community that is working to transform the B.C. food industry. Melissa Mills of Spread ’Em Kitchen is a Feeding Growth success story: her vegan dips are now sold in over 100 stores in four provinces. But it wasn’t always easy. She started with a blender and a bicycle selling at Farmers’ Markets without a plan or knowledge about how to scale up. “All of the Feeding Growth classes were exactly what I needed to hear and learn about. You get all your questions answered and learn about questions that you didn’t even know you had,” said Mills. 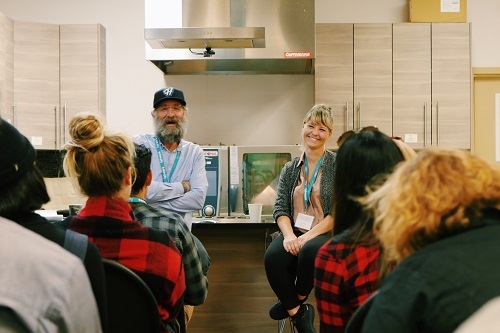 Mills shared her story with the group of 40 hopefuls at this year’s sold out workshop session on sales and distribution, with attendees such as Rocky Mountain Kitchen coming from as far as Fairmont Hot Springs for the workshop. To find out about upcoming events, visit feedinggrowth.com.